During its annual Transatlantic Conference the Transatlantic Dialogue Program of the Friedrich Naumann Foundation for Freedom offered its American and European participants a platform to discuss the current debate surrounding the Transatlantic Trade and Investment Partnership (TTIP) between the EU and the US: There is both bipartisan and transatlantic support for a free trade agreement between the US and the EU. President Obama, Chancellor Merkel, Senate Minority Leader Mitch McConnell, and former European Commission President José Manuel Barroso are among those who have publicly declared their support. Opposition to TTIP has been expressed mainly by labor and environmental activists. According to a study by the PEW research institute, younger Americans are much more supportive of international trade than the older generations. However, there is still little public debate about TTIP in the US. While elite audiences are aware of the transatlantic trade agreement and other trade initiatives, the treaty lags behind many other news stories. In a survey of Congress, only 32% of Republicans and only 34% of Democrats expressed that they have very good general knowledge about the agreement. While elected Republican leaders tend to be more supportive of trade agreements, the picture is different on the national level. Here, Democrats show a higher level of support for free trade than Republicans. 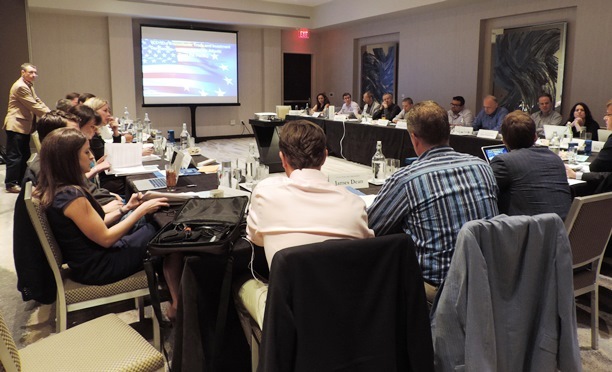 While TPP could be concluded as soon as this fall, in the event that the House passes fast-track authority, TTIP is still caught up in the midst of negotiations. When Vice President Joe Biden mentioned that the deal should be included on “one tank of gas” during his speech at the Munich Security Conference in 2013, the general assumption was that TTIP could be signed within two years. However, according to Ken Levinson, Executive Director of the Washington International Trade Association, that timeline was never realistic. While Levinson thinks that it is entirely possible that the U.S.-EU deal could be concluded in 2016, he stresses that there is no chance that it will be concluded this year. Turning the gaze towards the other side of the Atlantic, Levinson emphasized that the European public is broadly supportive of TTIP, contrary to current perceptions. While support is less in countries such as Germany, Austria and Luxembourg, other nations, such as Lithuania, Romania and the Netherlands, are widely supportive. According to Levinson, the Snowden revelations had a huge impact on German perception and trust in the USA. The revelations, which happened simultaneously to round one and two of TTIP negotiations, seized control of the narrative and created a vicious circle in which companies and political leaders who were supportive of the transatlantic trade deal backed off. A lack of trust in the EU still remains among the German public and some Germans would rather see the German government negotiate the deal. German participants of the conference criticized the German business community, saying that it has been too passive. While the German government publicly supports the trade agreement, the business community has done nothing so far to counter the narrative of the notorious chlorine chicken. 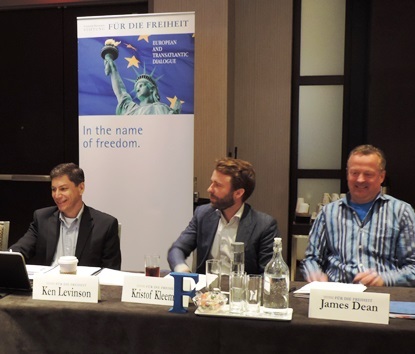 While it is important to highlight economic benefits of a potential trade agreement between the EU and the US, Kristof Kleemann, Chief of Staff of MEP Alexander Graf Lambsdorff, reminded the participants of the conference that there is also a security policy side to the agreement. The Ukraine crisis highlights Europe’s dependence on Russian energy. Russia’s threat to cut off gas supplies to Ukraine presents problems for the EU as a large portion of Russian oil for Western Europe passes through Ukraine. This dependency on Russia is a huge concern for Europe. Europe could solve this problem by creating energy unions or exploring new energy resources on European territory. In addition, energy exports from the US have the potential to change the security question in Europe. A free trade agreement between the US and the EU could help to make this happen. Today, gas exports from the US are subject to complicated licensing procedures and oil exports are completely banned. Including an energy chapter in the trade deal would allow US exports of natural gas and oil, reducing the EU’s dependency on Russia. The shale-gas boom in the US, coupled with the EU’s concern with Russia, have pushed the issue into focus. The EU and the US make up 50% of global GDP and 35% of global trade. Since 2000, the US has invested 10 times more in the Netherlands than in China. Therefore, Kleemann stresses, a trade agreement between these two major economic players has huge potential for standard-setting power. If the EU and US set common global rules in fields such as standards, regulatory cooperation, public procurement, subsidies, and services, major competitors like China would agree to whatever trade rules the transatlantic alliance offers. A trade agreement between the EU and the US also has the potential to revive the global trade liberalization process that has been put on hold since Doha. Reviving this through a trade agreement between two global players might seem counter intuitive, however, a deal between the EU and the US will scatter the message that economic and political liberalism remains the preferred and superior organization principle for driving a society. Yet the outcome of the negotiations is still uncertain. As the current debate shows, there is still a huge divide between those who support free trade and those who remain skeptic. An open dialogue between the two trade nations is crucial to unearth myth, create facts, and jointly find conclusions. The TAD will continue to provide a platform for this dialogue.